VITRINILE reflectance is a useful means of determining the grade of coal and coke, to ensure that blends used for energy generation and steel production are suitable and consistent. Vitrinite is a component of coal known as a maceral, and consists of polymers, cellulose and lignin. Measuring the amount of light reflected by vitrinite macerals is a key test to determine thermal maturity and the coal blend’s suitability for use. Standardised tests such as ISO and ASTM standards require the use of a microscope spectrophotometer such as the Craic’s 308 Coal, designed to measure the intensity of light reflected from a microscopic sampling area. The company says that the 308 Coal does more than that, and also acquires fluorescence and reflectance spectra of geological samples to more accurately grade them. The microscope spectrophotometer measures the light reflected from samples of the coal blend at hundreds of points, after which a statistical analysis is done by the computer. The results determine the amount of vitrinite in the sample, and its thermal maturity, and therefore its value for coking. Because so many measurements are taken on each sample, the process is traditionally thought of as very time consuming. 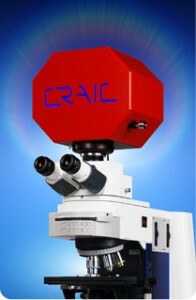 Craic says the 308 Coal automates the method and dramatically improves laboratory throughput and accuracy. The resulting histogram enables the thermal maturity of the coal to be determined. The 308 Coal measurse vitrinite reflectance and takes the reflectance and fluorescence spectra of samples, and also captures full colour digital images.